Summary: Ellen O’Farrell is a professional hypnotherapist who works out of the eccentric beachfront home she inherited from her grandparents. It’s a nice life, except for her tumultuous relationship history. She’s stoic about it, but at this point, Ellen wouldn’t mind a lasting one. When she meets Patrick, she’s optimistic. He’s attractive, single, employed, and best of all, he seems to like her back. Then comes that dreaded moment: He thinks they should have a talk. Last summer, I reviewed THE HYPNOTIST'S LOVE STORY by Liane Moriarty; and overall, I thought it was a pretty good novel. I didn't love it quite like I did WHAT ALICE FORGOT, but I also don't think it was fair of me have such high expectations. This novel has some very interesting characters and some unique twists, and I think fans of women's fiction will definitely appreciate this story. 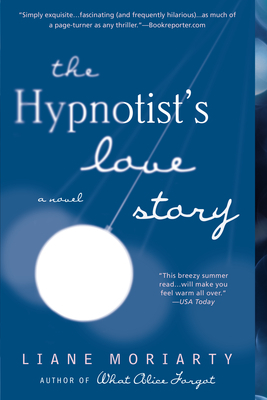 To celebrate today's release of the paperback edition of THE HYPNOTIST'S LOVE STORY, I have a copy to share with one lucky reader courtesy of the publisher. To enter, just fill out the form below before June 17th at 11:59 p.m. ET. I will randomly select and notify the winner the following day. This contest is open to those of you with U.S. addresses only. Good luck! I remember when this came out. I was staring at it and so close to buying it at a local indie store. I would love to win it. Thanks!